I only knew these as Horse Turds, that's what we called them, its what we were told growing up. I remember as a child, not knowing if I dare tell people we had cookies called horse turds, then as we grew up, it soon became a joke amongst all of us relatives. Every year, someone called Grandma to request Horse Turds on the goodie tray at Christmas time! A silly simple cookie that is super YUMMY! Lay wax paper over counter tops or table. Place rice krispies into a large bowl, set next to wax paper. Open marshmallows and have handy near wax paper. In a large heavy saucepan over medium heat, melt together caramels, sweetened condensed milk, and butter. Cook and stir until caramels are melted and the mixture is smooth. Place pan near wax paper on a hot pad. Have 2 forks, one to stab the marshmallow and one to help remove it from the other fork. 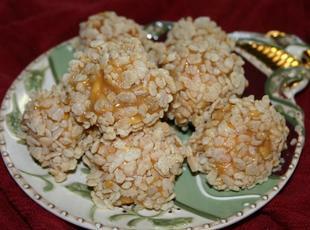 Dip marshmallow into caramel, then roll in rice krispies, then set on wax paper. Continue until all caramel is gone. If caramel starts to harden, you can return to stovetop to melt again. Allow to set up or dry at room temperature. Store in air tight containers in refrigerator or freezer. Can be left out all day on a goodie tray with no problems. Hi ,Thanks for sharing this recipe ,here I am in ireland ,hope to make some for 6th 'Little Christmas' as we call the Ephany last day of Christmas here in the Old emerald Isle. Looks so yummy! Can't wait to try the recipe! The name is just too much fun! Love the funny story and family name! Recipe sounds great! Funny name and story -- these look super good! And the recipe sounds yummy!!! Again, you have a slam dunk! this sounds absolutely fabulous for a treat!! In spite of the name! Nicely done! Sounds easy and delicious! I'll have to make them!!!! I am obsessed with the name of this recipe and it looks so delicious. Delicious looking cookie with a litte fun built right in ! Looks so ooey gooey good! Looks so good!!!!!!!! Gotta try 'em!! Wendy, I love it , look so cute!! good luck !! These sound great, but I think I won't call them Horse Turds or I will never get anyone to try them...LOL. Thanks for this recipe, I am trying this one soon. Yum! LOVE, LOVE, LOVE that name. These sound deliciously rich and sinful. Everything a girl wants in a sweet treat! These sound so funny but I bet they are so yummy unlike their name. He- haw, now we need some Donkey Turds, ha! It's a funny name but I bet it tasted really good! It's a funny name but the recipe is so easy and sounds yummy!